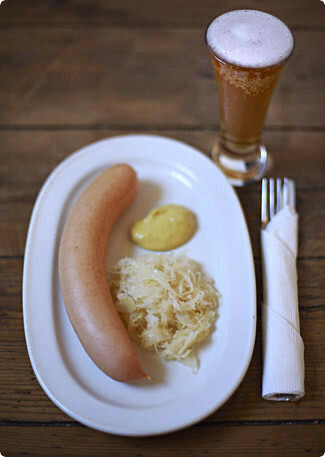 What do you know about German food? My dear readers, I owe you some news. Barely one year ago I woke up this page from a three-month slumber to tell you about our safe landing in Seattle, a return from Europe (for me, at least) to the city we thought we would be calling home for a very long time. I’m sure you remember. But life has a funny way of derailing even the best-laid plans, doesn’t it? When I wrote those words, for example, we could have never fathomed the storm that was brewing, and the impact the worst global economic crisis since the Great Depression would have on our new lives. And we certainly couldn’t have imagined that if, in late spring of the following year some work opportunities arose for Manuel back in Europe, we’d be willing to turn around and just like that say goodbye to our new home… But they did, and we did, and that’s how we came to find ourselves, one year almost to the day from the last time, delivering twenty-two boxes of household belongings to the port to be put on a freighter bound for Germany, and not long after, stepping on yet another one-way flight ourselves. In contrast to our move last year, this one was a piece of cake. I already knew all the questions to ask when calling shipping companies, and we knew exactly how and what to pack. Craigslist made liquidating our physical assets a snap, though it was hard to part with so many nearly-new things (including the ice cream maker I had coveted for so many years in Edinburgh!). Unlike last time Manuel went ahead, securing us a place to live and a car and some furniture, so that by the time I arrived the hard work was done, and all I had to do was get over my jet lag. That’s not to say it was all easy, though – saying goodbye to my family again was something I would have gladly done without. Also in contrast to our last move, this one happened very quickly. From inception to completion barely three months passed; in some ways the fact that we were moving didn’t actually sink in until after it happened. And sadly, the unexpected nature of the whole thing meant that we didn’t have much time left to enjoy our soon-to-be-former home. In particular I regret all the things we never had a chance to do, thinking at the time, of course, that we had years in which to do them. We never went camping on the coast, for instance, or hiking in the Cascades or kayaking in the San Juans. We ate in only a fraction of the restaurants in Seattle I wanted to try. We never planted a garden or owned a share in a CSA (actually that’s not entirely true – I signed up for one before we knew we were leaving, and we were able to work it out so that we got four weeks’ worth of beautiful, farm-fresh veggies before passing our share on to someone else). We never cast our sails and explored things further afield like Vancouver and Eastern Washington and California and Mexico. And of course we never got a dog, which, in light of how things turned out, was probably a good thing. But then, there were so many things we did get to do. I got to spend more time with my family than I had in a decade. We got to live in a beautiful cottage by the sea, waking up every morning to one of the most spectacular views in the world. We stuffed ourselves silly on Mexican, Ethiopian, Japanese and Vietnamese food, including so many Bánh Mìs from Seattle Deli I’m sure they’ll notice a drop in profits now that we’re gone. We had picnics on the beach and barbecues in the rain and glasses of wine against the backdrop of a city aflame in the evening sun. We also got to spend more time with each other than we had, well, ever. And just as I consoled myself about leaving Europe, I’m telling myself now that Seattle will always be there, home for me in theory if not in practice. And who knows, maybe someday in practice again too. And to think, learning to pronounce them all correctly is only the start of the adventure. I have been following your gorgeous blog for quite some time now. I am an Australian expat living in Bad Homburg, which is about 2 1/2 hours southwest of Göttingen. I am so thrilled that you have moved to Germany. I totally love the lifestyle and travel here, but I have to be honest and say that I miss the wonderful fresh seafood, great quality beef, lamb and asian influences in cooking back home. I’ve been retraining my taste-buds and there are some dishes here that I have grown quiet fond of but I wish I had more time to experiment. Therefore, I will be devouring your blog (even more) from now on, as you start to experiment with local produce. A couple of tips: Traditional food like Schweinehaxe (roasted ham hocks) can be beautifully tender and melt-in-the-mouth when prepared by someone that knows how! The cheeses (Käse) and fresh organic fruit and veg (Obst und Gemuse) available from your open-air local farmers markets (twice a week) are wonderful. It’s the right season for making Pflaumekuchen (batter cake with glazed sliced plums on top) which is delicious. If you and/or your partner drink beer of course Germany has the nicest beers (followed closely by those in Belgium). Good luck with your new adventure and I am looking forward to your next post! Viel Spaß! When you get to Bavaria, please hunt down Obazda — a yummy, artery-hardening cheesy spread served with pretzels. Wilkommen an Deutschland! Good luck in your new home! I look forward to reading about your adventures! Thank you for that wonderful installment of perspective and optimism. It’s easy to get on the computer and see people venting their frustrations over life’s inconveniences. Nice to see someone appreciating the adventure. I can’t wait to see what happens next for you. It’s certainly not easy moving overseas, as I’m sure you already know.You will miss things about your old home that you never even knew you loved.But by the same token, there are a million new adventures to be had, things you never imagined.I wish you the best of luck with your new life and hope many good years await you there! bittersweet yet exciting…look forward to hearing more about your new adventures! wow, such a surprise! i hope you two get settled soon, and all the best wishes in your new home. looking forward to see what you discover. here’s to new adventures! WOW! So glad to have you back, and such exciting news! I’ve only been to Germany once, and it was when I was 15, so I’m not sure it should count. Göttingen sounds wonderful, and so many places to explore from there. Imagine what the next year could bring! Melissa I can so relate to this post. This year we were supposed to move away from Germany a home to me for almost 16 years, but as you say life takes funny turns. We’re still in Germany and all I can say is welcome to Deutschland hope you like it. Like Claudia said it’s a lot more that Sauerkraut & Würstchen. I#d love to help if you have any questions! Welcome back to Europe! I’m excited to read all about your continuing adventures, both food and non-food related. If you decide to make a trip to Switzerland and Zurich I’d be happy to show you around! Oh Melissa, I’m sorry to hear that you’ve had to move again in such a short time and to leave your family, but I’m glad that you’re slightly closer to me now 🙂 Take care and let me know when you and Manuel have a chance to come to London. Welcome to Germany! It’s not all sauerkraut, and even that can be good if well prepared. I look forward to reading about your discoveries and adventures. I would truly love to go to Germany! Oh yeah! Welcome back to Europe! Ah Deutschland… We’re hoping to move back there after our 3 year stint in England. Herzliche Wilkommen 🙂 Europe is exciting with rails and transport well connected to get you anywhere for a foodie getaway or lil adventure. You will love it! Herzlich Willkommen! If ever you come to Kassel just a few miles south of you, drop me a line, me and my wife will be most glad to show you around. You know, show you the Cascades and eat some ‘Ahle Worscht’, some local flammkueche with ‘Duckefett’ or just have a slice of smetana cake. Also, if I can help with translations or anything else, just mail me at Reuben at Morningchilde dot com. I am **SO** jealous. Gottingen is a beautiful city. I remember there is a fabulous pastry shop on a direct line into the city from the train station. Gosslar should be your first weekend trip. Don’t miss Fulda either.Do us all a favor and convince people here that there is more to German food than wurst and sauerkraut. Real pork tenderloin (lendchen). Maultauschen. Poppy seed cake. Chanterelles should be in season now. Steinpilze. Wild boar. Berries. Kohlrabi. Bienenstich kuche. Cream, cream and more cream (creme and sahne).Heresy in foodie circles – but I always thought that the little pastry shops in our village (Flieden) were better than anything I ever ate in Paris.Convince your family that flights to Germany are cheap in the winter – that they must come visit you for six weeks of German Christmas. I don’t know a lot about German food. Hope you can share to us a little of what you have learned while staying there. Good luck on this new adventure! I haven’t been to Germany, so to me it sounds like rather an exciting adventure. Good luck with all the challenging parts, and I know you will make the most of the fun times! Exciting news! As a similar transplant to the US with a Danish husband and children in tow, we still wait for the other shoe to drop that will return us to Europe. I look forward to reading your blog from Germany! oooh, I’m so jealous! I keep telling my husband he needs to find an expat job in Germany, but somehow he doesn’t quite get the hint.. 🙂 I lived in Germany when I was 7, and those memories.. sigh.. I’d love to give my daughter the same experience! Welcome back to this side of the world. I look forward to hearing about your new food discoveries. My Austrian friends have convinced that autumn and winter are the best times for Central European foods–mushrooms, plums, braises and the like. Welcome back to Europe Melissa! Life does throw things at us, doesn’t it? If you ever have a chance to come to Rome, Italy (where I am now! ), I would love to show you my foodie Rome! Excellent! Welcome back to Europe! I love reading your blog and was very disappointed when you moved to Seattle. Glad to have you here in Germany and looking forward to hearing about all your culinary adventure and hopefully, copying some of them. Viele Liebe Gruesse aus Heidelberg! Oh wow! What a huge move! (I relocated from the UK to OZ around the same time you moved to the USA and I could not even imagine doing it again now!) Germany is a pretty great place to live – I cannot wait to see what you post now that you are back in Europe. I loved all of your travel features. Aha! Now you have given me the perfect excuse to link to your beautiful blog with all the other expat blogs on The Blue Suitcase! Seattle is home for me, too, in theory. In practice, I’m your neighbor the Netherlands. I’m really jealous – I would give up a lot to be able to "legally" live in Europe, especially in Germany! I lived there for a year, and fell in love but then I had to leave for visa reasons. Enjoy, and feel very lucky for your recent change! Fantastisch! I lived in Munich for the better part of a year and grew to love the markets there. There was a woman at the Italienische Feinkosten in the Viktualienmarkt that used to draw me into conversation and then give me a recipe. It will be a big change from Seattle to be sure, but I’m certain you and Manuel will find adventure aplenty! Reading this post makes me so jealous! I can only hope you will enjoy the culinary treasures of Germany as much as I have. Germany is ready to be re-discovered and I am thrilled you will be a part of it! The different regions are so beautiful and unique — each one truly individual. Although I’m hugely biased, I highly recommend spending time in gorgeous Bavaria– the people are the friendliest in the country. Oh, and Obatzda IS the yummiest stuff in the world. Let me know if you want my recipe! Woah! I certainly did not see this coming! Between the dread of leaving your family and home, and excitement of moving to a place with lots of possibilities, I wish you & Manuel well! Welcome to Germany und viele Grüsse aus München! I lived and worked in Deggendorf in Niederbayern for 6 months during college and absolutely loved it there. We rode the rails every weekend to a new adventure, but there was still so much in Germany that I wish we’d been able to explore. The food is wonderful and we still seek out authentic German food whenever we can. There are so many regional favorites and all are really worth exploring. The Christkindlmarkt in Nürnberg was wonderful, but there are Christmas markets in even small towns worth going to. I’d suggest the Glühwein- warm, mulled wine in December is divine! I will definitely be checking back at your blog often to fulfill my food nostalgia. Will you change the postage stamp etc on your envelope? Am glad you managed the move successfully, and good luck settling in. I’m rather amused to read all this as well – I’m another ex-Edinburgher (I posted here once before to comment that I was living in the same building where you once did) who’s also moved to Germany! The same state, even. I’m in Oldenburg, which is north-west of you.It’s horrible leaving your family behind – my mother helped me move and then I burst into tears at the airport when she left – but every time I keep telling myself I’ll get used to it. And I’m resigned, mostly. But it’s still painful.I could live on bread and cheese, so Germany is probably my food paradise, but there’s a lot more out there too. And supermarkets seem a lot better than when I last lived here, which is a major relief. (Though customer service is still…mixed.) And sympathies over dealing with the bureaucrats. I’m actually a dual citizen, so no residence issues, but the citizenship is extremely new, and thus I’m having trouble getting people to explain things to me that they assume every German’s known from the age of four. Well, I don’t! Alles Gute! Herzlich Willkommen in Deutschland! Hope you will enjoy your time here. I follow your blog since a long time and it will be very interesting to see the food and everything else from a different angle :-)))If you like to visit or to know something about Cologne or Detmold, please let me know. Dear Melissa,Don’t they say that for every door that closes, another opens? I so envy you the fresh vista and the unexpected (in a good way) that awaits you and Manuel. Life is such an adventure if you grab it with both hands, fearlessly. On a more mundane level, if you ever come across the real recipe for "broetchen" please share it with the rest of us. Chuess! Melissa, wish you a great spell back in Europe. YOu are a tad closed to the UK now.just across the pond sort of speak. The global move. I have shipped boxes of my life from two countries back to South Africa three times over the last 10 years. Usually less than a year later I always end up back at OR Tambo International Airport, passport in hand and ready to go live elsewhere. Enjoy settling into your new home again. Well I’m from Italy where the food is a dream! But I live in Germany….and i can say it’s not really the same……..